Brian Eaton started flying as a child with his father, Burt, a Continental Airlines 737 Captain and has continued on to make a career of helping people learn to enjoy aviation in a safe and fun environment. While developing his teaching technique over the last decade Brian has come to enjoy building new relationships and sharing in the achievements and satisfaction his students feel with each milestone accomplished. It continues to be his pleasure to operate as Chief Pilot of Front Range Flight School where people can come together and be around like minded individuals who are passionate about aviation and work to help each become better pilots. Brian Grieve grew up in Evergreen, Colorado and has always had a great interest in the aviation world. He started flying in January of 2017 and has loved every moment of it. Since starting flying he has been able to obtain his Multi-Engine and Single Engine Commercial Certificates along with his Flight Instructor Certifications. Brian’s long term goal is to become an Airline Pilot and he plans to be an instructor to help him reach that goal. Outside of flying Brian enjoys trying to stay outside and active as much as he can. When the time allows, he will be camping, hiking, or playing any sports that allow him to stay outside. As a retired airline pilot, Burt has many years of experience, and is now able to fly as a hobby and help others achieve their dreams of flying as well. Burt has been type rated in the following aircraft: B-737, B-757/ 767, BA-3100, and F27. 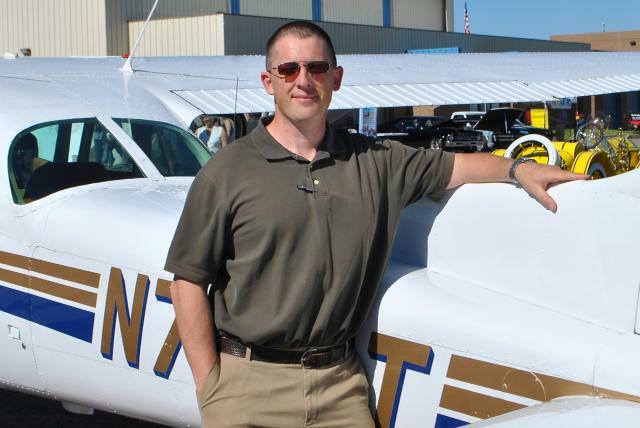 Jorma Jennings has been working as a CFI at Front Range Airport since 2005. From that start, he has found great joy in working with new pilots and helping them achieve their flying goals. Jorma graduated from Embry-Riddle in 2007 with a Bachelors of Professional Aeronautics. When not flying, Jorma teaches people to use web-conferencing and eLearning software. Tiffany began flying in 2013 after her father encouraged her to take a flight in a Cessna 150. That one lesson was all it took to make her fall in love with aviation. She began working as a civil engineer in airport infrastructure and took flight lessons on the side. Her career moved her to the Kansas DOT where she eventually became the Director of the Division of Aviation. During this time she continued flight training to CFI, CFII, and MEI. Tiffany flew in the 2015 and 2018 Air Race Classic. Tiffany moved to Denver for a project management position with the Federal Aviation Administration, Airports Division. Tiffany became a flight instructor to share her passion and excitement for flying with others. As long as I can remember I have been interested in flying. As a kid, my dad would take me to watch planes at the old Stapleton Airport. Although my dad is not into aviation himself, I know he is the reason I am because of that. I attended Metropolitan State University of Denver and obtained a Bachelors of Science in Aviation technology, meanwhile doing my flight training at the same time at Rocky Mountain Metro Airport. In June 2016 I obtained my CFI and CFII, and have been enjoying instructing since bring brought on at Front Range Flight school. I have always dreamed of becoming an airline pilot one day so I’m excited to see where my career takes me from here!